In his article on the Sanders of Stafford, Fairfax, and Loudoun Counties in Virginia, Jim Sanders mentions several lawsuits in Fairfax County, Virginia, involving Francis Sanders, Daniel Sanders, and Lewis Sanders, Jr. Based on our research, Jim and I assume these men were brothers and sons of Lewis Sanders, Sr., who is believed to have been our immigrant ancestor. The evidence that Daniel and Lewis were sons is likely because of family tradition and documents that show they had mutual business dealings. Though there is no family tradition about Francis, Jr., being a son of Lewis, he also had business dealings with the others and he was a chain carrier for a land survey Daniel Sanders registered in 1745, hence our assumption that Francis was also a son. To add to the family tree, there is also a document from 1753 that names Moses and Aaron as sons of Francis Sanders. We cannot be certain that these two sons are the brothers Moses and Aaron who appear in the 1770s in Montgomery County, North Carolina, but we do have Y-DNA evidence that the Sanders of Montgomery County in North Carolina are part of the same Sanders line as Lewis Sanders of Fairfax, Virginia. From the court cases that Jim examined, the brothers--Francis, Daniel, and Lewis, Jr.--encountered financial problems, probably caused by crop failures. Francis had assisted Daniel with his land survey and acquistion in 1745, and the two probably farmed the land together. At least, this is what we think happened. What we know is that in June, 1750 William Wallace sued Francis and Daniel Sanders for 1356 pounds of tobacco. Apparently, they had not paid for their seed or other agricultural necessities in a timely manner. Wallace prevailed in court and the Sanders brothers were charged interest from June of 1747. On the same day of the suit against Francis and Daniel, John Pagan, a merchant of Fairfax County, sued Lewis Sanders, Jr., for 388 pounds of tobacco; from this, it appears the three sons of Lewis Sanders Senior were sued on the same day by two different merchants. Further, in January of 1752 Robert and Edward Maxwell, merchants of Fairfax, sued Francis Sanders and Lewis Sanders. Though there is no indication given, the suit was probably against the younger Lewis, not his father. It is possible that additional Sanders brothers were farming together for in December 1754 the estate of Richard Shore sued Francis and James Sanders for two pounds in currency. William Janney, a well-known Quaker in the community, was their bail. The suit carried interest from January of 1752, the date of the causal factor for the suit. Francis had leased property from Mahlon Janney in 1753 and this relationship may account for William Janney being the bail for Francis and James. We are unable to determine how this James Sanders is related to the other Sanders; he could be another brother of Francis or a cousin or other relative. In addition, Francis Sanders, individually, was sued by the estate of Richard Shore on the same day and pled not guilty and requested a jury trial. He did not appear for the trial. In 1755 Francis and Fernando O’ Neale, along with Joseph Phillips and Marty Connel, were sued by the estate of William Maddie. Moses and Sarah Sanders, Phillips, Connel and O’ Neal are connected in another action in 1764. Sarah Sanders is probably the widow of Francis Sanders and the mother of Moses. Whether Fernando O'Neale has any non-business connection to the Sanders family is not known, but he seems to have been associated with the Sanders for several years. In July of 1756 Francis Hague, a Quaker, sued Francis Sanders. In this case, Francis Sanders prevailed and his costs were borne by the plaintiff. In May/June 1757, Francis was noted in a lawsuit against John Murry. Francis Sanders prevailed and was awarded two pounds and five shillings and six pence and one hundred pounds of tobacco. Jim Sanders and I think Francis Sanders died about 1761. Sarah Sanders is listed alone in a tax record in 1762, and in 1765, Sarah Sanders is referred to as a widow. We assume this is the same person, though there is a possibility that the widow Sanders could be someone other than the surviving wife of Fancis. The children of Francis continue to appear in some court cases in the 1760s but not after 1770, hence our belief that they moved to North Carolina, stopping in Brunswick and Halifax counties in Virginia. It was in Brunswick County that Moses Sanders met his future wife, Mary Hamilton. Lawsuits such as the ones mentioned above were common in colonial America and their existence does not necessarily indicate that the Sanders brothers of Fairfax were particuarly inept at farming or that the suits against them were meritorious. Arrest warrants were often used to make sure that people would show up for the court case. Land was the main form of wealth and disputes over land and mortgages were frequent. Though we often do not know the final disposition of some cases or the merits of the arguments on either side, court cases such as these occasionally enable us to determine family relationships or to decide whether someone was still alive at a particular time. 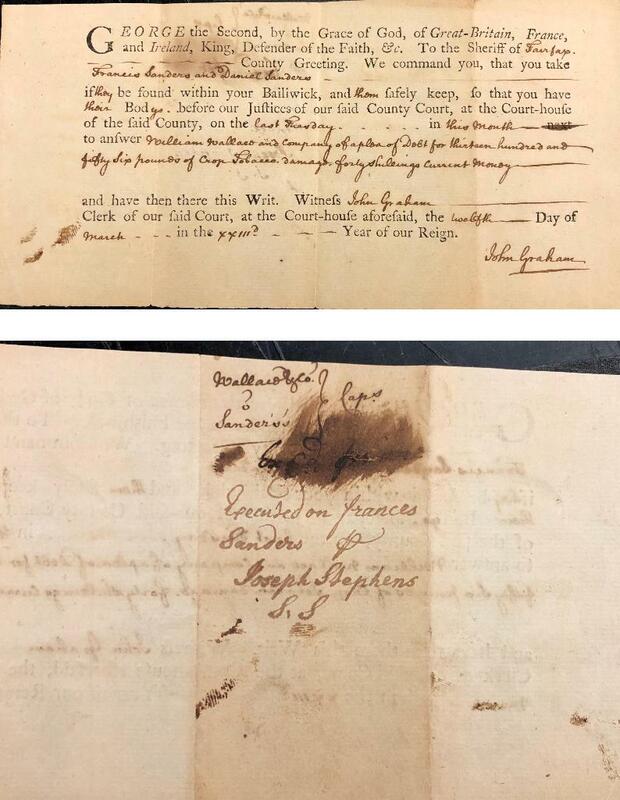 "I have come across for sale two arrest warrants 1749/50 issued to the Sheriff of Fairfax County for the arrest of Francis and Daniel Sanders of Fairfax. I see that you posted notes relating to your family research.I have not read all of the note, but I saw a reference to a William Wallace suing Francis and Daniel in 1750 for 1400 pounds of tobacco. Without further inspection of the records, it really sounds like the two arrest warrants are related to this lawsuit...They are being offered at an auction this weekend in a group of a few other similar early documents." ASSORTED AMERICAN DOCUMENTS, LOT OF FOUR, comprising an 1814 South Carolina Militia Infantry subsistence account of Ensign Arramanos Lyles of Col. McWilley's Regiment, two 1749/50 warrants issued to the Sherriff of Fairfax Co., VA for the arrest of Francis and Daniel Sanders, and a 1770 Bedford Co., VA legal decree of debt. Very good overall condition with folds, decree with separations at folds. I have looked again at the auction house picture of the arrest warrants and while the picture is very poor I think one warrant is for the arrest of two people; I assume Francis and Daniel as set forth in the description of the warrants. But the other warrant appears to be for only one person; can't identify who. I originally thought the date 1749/50 in the description referred to a single date for both, but on reflection I think one is 1749 and the other 1750. The auctioneer’s description is “Assorted American Documents and as to warrants it states, “two 1749/50 .... for the arrest of Francis and Daniel Sanders.” You would think there are two warrants and both for Francis and Daniel or one for each of them. Not the case.You can see pictures of the Sanders’ warrant it is issued on March 12, 1750 and is a single warrant for both Francis and Daniel. It requires the sheriff to seize them and make sure they are in court on the last Tuesday of that month, March. It is styled as the 23 year of the reign of King George the Second which began June 11, 1727. I think the auctioneer called the warrant 1749/1750 because he was not sure of the calculation of the 23rd year of reign. Also as a practical matter, the sheriff usual did not physically seize the person and put them in jail and then on the appointed date take them from the jail to the courthouse. The sheriff usually served a notice of sorts or told the person of the trial date and then the person voluntarily appeared. But the sheriff had authority to lock someone up if he wished. The back of the warrant has a notation by Joseph Stephens, the deputy sheriff or someone working for the sheriff that he served the warrant on Francis; no mention of Daniel. As a practical matter this document would have been returned to the Clerk of the Court for the official file. Thus the notation is placed on the warrant to show what happened after the Clerk of the Court, in this case, John Graham, issued the warrant. Graham probable issued it with the return date at the direction of the Judge as the Judge prepared his trial schedule or by the Clerk as he prepared the Courts trial schedule. I think this is an amazing document for the Sanders family. First, remember it is 268 years old. Very little stuff has survived 268 years under any circumstances. How much 268 year old stuff is known to exist for the Sanders family anywhere? Second, after it was executed and it would have been returned to the Court. Most all Court documents were either retained by the Courts or destroyed by the Courts over the years. The fact that this document has survived and is in the public domain is very unusual. Third ,this document relates to the case of William Wallace suing Francis and Daniel Sanders seeking 1356 pounds of crop tabacco and 40 shillings in damages. This warrant clearly relates to the case cited in the Sanders blogs referring to William Wallace and 1400 pounds of tobacco. I suspect that when the case was over and interest calculated and the 40 shillings calculated in terms of tobacco you have the 1400 pounds of tabacco mentioned in the Sanders blogs. In summary, I think it is really amazing that this document is 268 years old, is usually not in the public domain; is specifically referred to in Sanders family research blogs; is known to the Sanders clan and is available to the Sanders clan. After some discussion with Dennis, we involved Cathy L'Altrelli, a Sanders researcher who is a Fairfax native and a descendant of Francis Sanders, in our conversation and she indicated a willingness to buy the Francis Sanders document with the understanding that Dennis would bid on the lot of four documents and if his bid was successful, then he would retain the document he wanted (the Bradford one) and he would then sell the Francis Sanders document to Cathy. Among the other documents were one involving Fernando O'Neale being sued by merchant William Hicks for 2000 pounds of crop tobacco and ten pounds in damages. Dennis successfully made a bid and the documents were purchased. After she received the Francis Sanders original warrant, Cathy L'Altrelli graciously decided to donate it to the Library of Virginia, the official online repository for the state of Virginia. It will be available to the public there and will be safe for future generations. She also made an excellent copy of the document so that I could post it here at this Web site for the use of other Sanders family historians. Although the document provides almost no genealogical information, it is nevetheless important for our Sanders history. As Dennis Dutterer noted, it is very rare for documents this old to be returned to the original family after a nearly three hundred year absence. The provenance of the document from 1750 until it was offered for sale in August 2018 is unknown, but the story of where the document has been all those years and in whose possession it resided would be an interesting story in itself.